If you want a tub that’s a bit fancier than a standard alcove model but isn’t so fancy as a freestanding one, a drop-in bathtub or undermount bathtub can be the ideal middle ground. What should you look for when choosing from the best drop-in bathtubs? We’ve rounded up a few favorites and will give you the full scoop below. When choosing from the best drop-in bathtubs, it’s important to think of your specific needs, as that will determine which tub will work best for you. The significant differences between the best undermount tubs we reviewed had to do with size and features. One of the tubs, the American Standard Evolution Whirlpool, had water jets to help make your bath time experience more relaxing. The remaining four were standard drop-in bathtubs. Regarding size, our picks ranged from five feet in length to six feet. One of the American Standard Evolution tub models was six feet long and three wide. The rest were five feet in length, which is probably perfectly acceptable for a person of average height. Although undermount tubs often come in a range of materials, all of our picks are made from acrylic, which has the advantage of being lightweight, a good insulator and relatively durable. 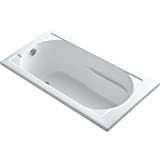 The Evolution Bathtub from American Standard is a flexible tub. By that we mean it’s one of the best drop-in bathtubs and it can also be installed as an alcove tub, with a few adjustments. 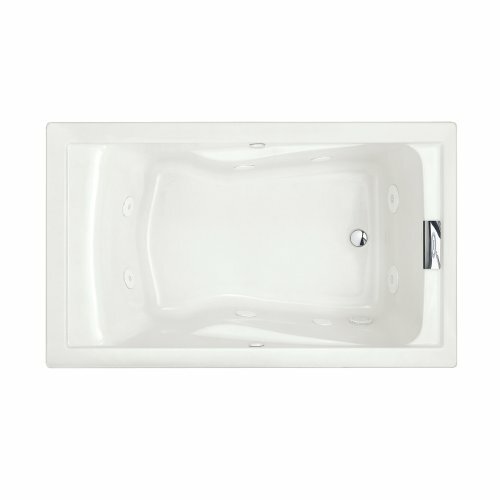 This undermount tub is designed with relaxation in mind. It includes a pair of armrests and a backrest so that you can lean back comfortably while soaking. Many standard tubs are a bit too shallow for long soaks. 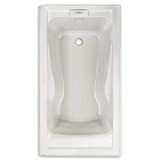 The Evolution Bathtub solves that problem and provides an extra three inches of depth. The only drawback to that is you need to purchase a special drain to accommodate the increase in depth. The tub is made from acrylic and has a smooth, slippery feel to it. People who bought and used the tub noted that it’s not an anti-slip tub, but that might be preferable. Other users of the tub were pretty satisfied with it, particularly the ease of installation and the bathtub’s appearance. A few did have a complaint about the surface, with some noting that it had air bubbles on it. Deeper than average tub (17 inches). Has armrests and a backrest. Made of acrylic, so it’s lightweight and durable. The tub isn’t very long (5 feet), so it might be too short for taller people. You need to buy a special drain to use the tub. If the above American Standard Evolution bathtub seems a bit too small for your needs, the Evolution 6-foot deep soak bathtub might be just right. It’s a full foot longer and several inches wider than other Evolution tub models. Plus, the tub has an added depth, which allows you to sink in and enjoy a long soak. The water depth is 18.5 inches. Of course, to get that extra depth, you need to purchase and install a special deep soak drain. Another important feature of the 6-foot Evolution bathtub is that it can be used as either a drop-in tub or an alcove tub. 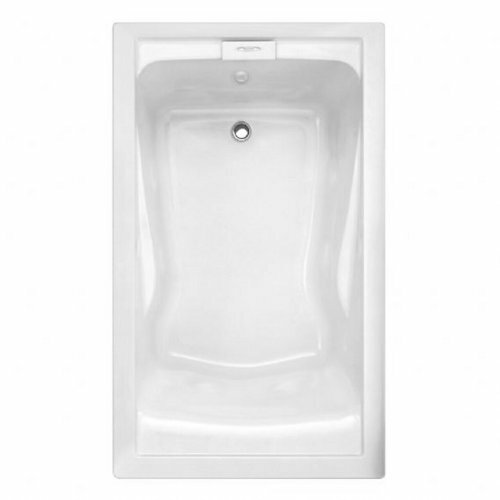 As a drop-in tub, the drain can be placed on either the right or left side. People who’ve used the Evolution 6-foot bathtub are pretty happy with it, with many calling it very comfortable and easy to install. Some even compared it to having a tiny indoor pool. The extra long length and increased width make for a more comfortable and relaxing bath. Armrests and backrest for comfort. Acrylic material is durable and helps to retain heat. You need to buy a special drain to take advantage of the increased depth. Some have said that the drain stopper is difficult to use. If you want to relax in the bath and enjoy a massage at the same time, the Ariel Platinum Whirlpool Bathtub might be just the one for you. In fact, if you’re a person who’s really into “extras,” the Ariel bathtub might be perfect for you. The tub doesn’t just have whirlpool jets and adjustable water flow settings. It also has a Bluetooth radio so that you can relax with music or your favorite talk radio program. There’s also a touchscreen keypad attached to the rim of the tub, so you can easily control the tub while you relax. 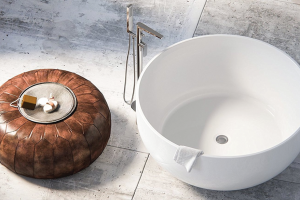 The Ariel tub is designed to be a drop-in or a freestanding model, although some have noted that the back of the tub is less finished looking than the other sides. Users of the tub have been impressed with it, with a few noting that they were initially suspicious of the fact that it was acrylic but ended up being surprised by the quality. The one issue that some people had was that the fittings on the tub felt loose and that their plumber recommended tightening them, but also noted that doing so could void the tub’s warranty. Whirlpool tub with 14 jets. The tub is long and deep. Installation can be tricky because of the additional features. If you want a whirlpool tub but maybe don’t need LED lights or radio, the American Standard Evolution Whirlpool bathtub might be the one for you. The acrylic bathtub is 5 feet long and 3 feet wide and has eight adjustable whirlpool jets which can massage your cares away. The tub’s acrylic is reinforced with fiberglass and also features a proprietary additive, EverClean, which is designed to inhibit the growth of mildew, mold, and bacteria in the pipes. Like the other models in the Evolution line, the bathtub needs a special Deep Soak Max drain to accommodate the increased depth. For the most part, people who bought the Evolution whirlpool bathtub were happy with it. A few complained that the acrylic material was a bit low quality and that it scratched easily. Has whirlpool jets for massage and relaxation. The extra deep tub is ideal for soaking. Acrylic seems to scratch easily. Length (5 feet) might be too short for some people. 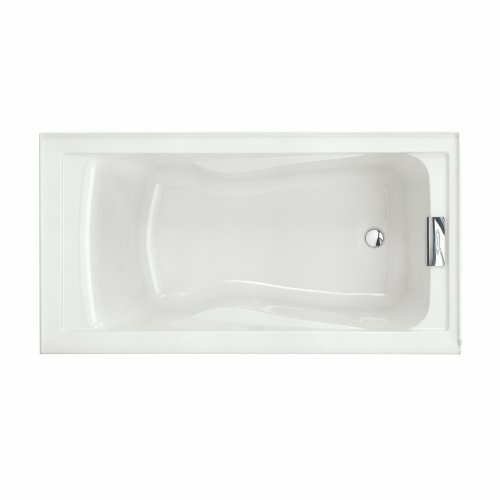 Sometimes, simple is best, and that’s exactly what you get with the Kohler Devonshire Drop-in Bathtub. It measures 5 feet in length, 20 inches in height and 32 inches in depth. As a drop-in bathtub, you can arrange it so that the drain is on either the left side or the right side. The acrylic material makes the tub durable but also lightweight. 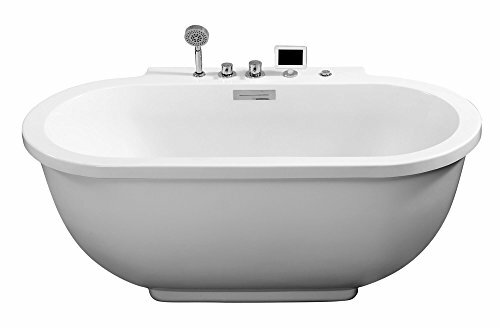 As far as comfort goes, the tub includes two armrests and has a curved back. While the back and armrests might make it a bit more comfortable for lounging in, the size might be a challenge for some. Since the tub is only 5 feet long and less than 3 feet wide, it might be a tight squeeze for all but the very short or the very thin. People who used the Kohler tub were mostly pleased with it but had some words of warning. A few cautioned that you need to be sure to buy the right drain kit to use with the tub and there are cases when the recommended kit isn’t the right one. Durable and lightweight acrylic construction. Simple design and easy installation. The tub is very small. Doesn’t have much in the way of features. If you want to take long, relaxing baths at home, you’re going to need a bathtub. But choosing a bathtub can get complicated, as there are so many different types and materials to pick. 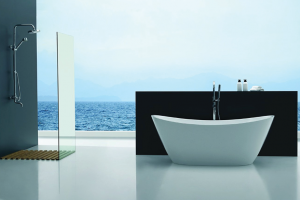 Let’s take a quick look at the different types of bathtub out there and go over when each style might be the best choice for you. Drop-in Bathtub. Drop-in tubs get their name because they lowered into, or “dropped in” to a platform or frame, called a surround. The surround covers up all the sides of the tub so that only the top rim and interior is visible. Alcove Bathtub. An alcove tub tucks into a recessed area in a bathroom and is usually surrounded on three sides by walls. One side of the tub is finished and visible. Free-Standing Bathtub. A free-standing tub is finished on all sides and sits on its own in a bathroom. A vintage claw-foot tub is an example of a free-standing bathtub. Corner Bathtub. A corner tub tucks into a corner of a bathroom. Two sides are against the walls, and two sides are finished. Aside from how they are installed in a space, bathtub types also differ when it comes to size. Alcove types are usually the smallest while corner and drop-in bathtubs can take up more space. Free-standing tubs are also occasionally on the small side. But since they require space on all sides, they usually have a larger footprint compared to drop-in or alcove bathtubs. 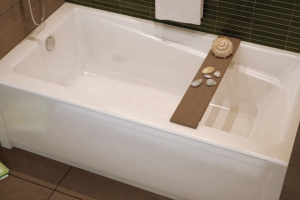 Another thing to consider when choosing the best drop-in bathtubs is the material the tub is made from. A tub’s material will influence a few factors, including its price tag, durability and care instructions. That said, one type of material isn’t necessarily “better” than the other types. When choosing a drop-in tub, it’s all about picking the material that best suits your needs. Acrylic. Acrylic tubs have the benefit of being lightweight and able to retain heat, so your bath water doesn’t cool down too quickly. The drawback of them is that they can scratch easily. Cast Iron. Cast iron tubs are usually covered in porcelain enamel. They’re super durable, heavy and don’t retain heat that well. Enameled Steel. Enameled steel bathtubs weigh less than cast iron tubs. But like cast iron tubs, the steel conducts heat away quickly. Fiberglass. Usually, fiberglass tubs are the least expensive available. The material is lightweight, inexpensive, and retains heat, but isn’t very durable and has the shortest use life. 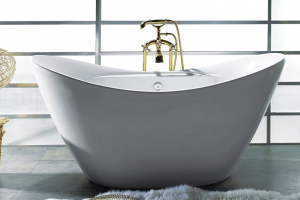 Bath type and materials aside, what else should you think about when buying a bathtub? Here are a few questions we think you should ask yourself. How will you use the tub? 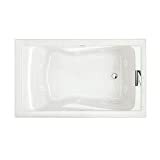 Do you dream of taking long, luxurious baths or are you looking for a tub to use for washing up kids or pets? 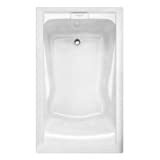 The best drop-in bathtubs are usually well suited for either use. How much space do you have? If your bathroom is tiny, you might not have room for a drop-in bathtub. Is the tub going to be too heavy? A bathtub filled with water can weigh a lot, especially if the tub itself is large or made of heavy material. Depending on weight, you might have to reinforce your bathroom floor. Do you feel comfortable in the tub? Before you install a drop-in bathtub, sit in it. If you feel cramped or if your arms and legs are at weird angles, the tub might not be the best one for you. If we had to pick a winner among the best drop-in bathtubs (and we do), we’d choose the American Standard 2422V002.020 Evolution Bathtub with Dual Molded-In Arm Rests. While the tub doesn’t have many extra bells and whistles (like whirlpool jets), it’s not so simplistic that it will leave you wanting more. 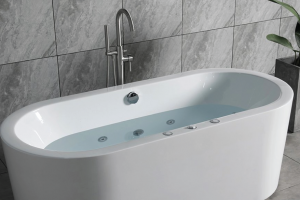 The tub has enough features to make it comfortable to relax in and also has the added benefit of increased depth, so you can get in a good, long soak. We recommend it as the best drop-in bathtub of 2018.